In winter the ski-bus stop for the Siusi Alp orbit and the centre is directly near the farm. The ski area Gardena/Siusi Alp is ideal for families with light and more difficult ski-runs, cross-country tracks and toboggan runs. In summer the shuttle bus of Castelrotto brings you to the Siusi Alp orbit. Our farm lays at ca. 1 km from the centre. An unforgettable alpine panorama view will wait for you on the Siusi Alp. Take the motorway “ Autostrada del Brennero ” A22, exit Chiusa , turn to the right and pass over the bridge “ Isarco ”. Turn to the left in direction south until Ponte Gardena. Pass the large bridge and at the roundabout turn to the right taking the direction Castelrotto/Altipiano dello Sciliar. 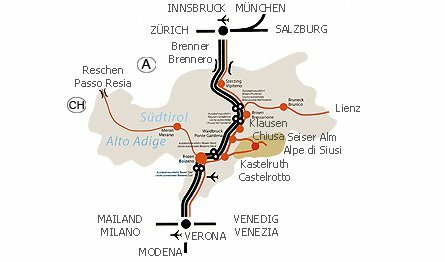 Take the motorway “ Autostrada del Brennero ” A22, exit Bolzano nord , go on in direction north until Prato Isarco . Here, in the tunnel turn to the left taking the direction Castelrotto/Altipiano dello Sciliar . The road passes two villages – Fiè and Siusi – and the next one will be Castelrotto.